Two weeks ago the National Level Exercise 2011 concluded. For HauteSpot and Global Emergency Resources the results of the exercise were absolutely terrific. GER's HC Standard product provided reliable patient and resource tracking from various sites across multiple states to central management sites. HC Standard was embellished with live video streaming provided by the HauteSpot built eWRAP and microNVR. 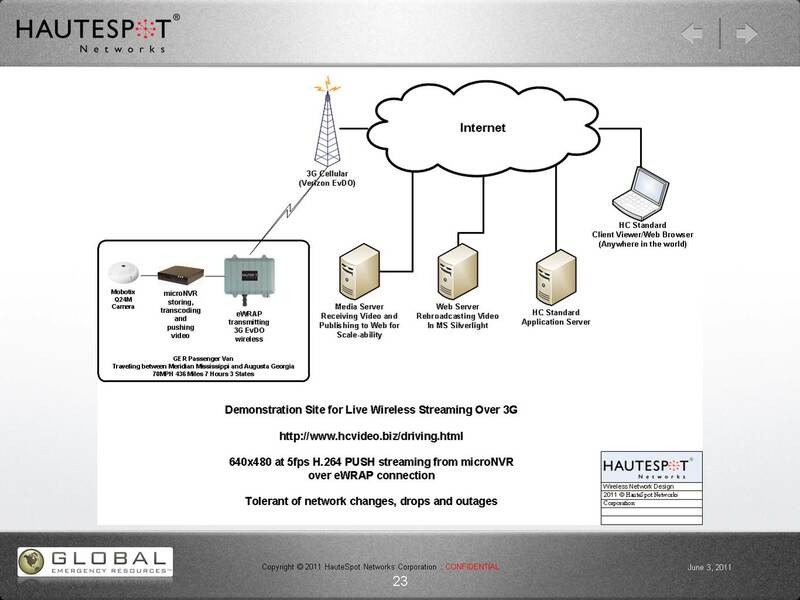 Here is a short video sample showing HC Standard with live video being fed via 3G wireless over a eWRAP router. In the case of Volk Field in Wisconsin we were 15 miles from the nearest Verizon tower. Despite this, for much of the exercise we were streaming VGA resolution video at 10fps back to the Internet. In the case of Meridian Mississippi, the cell tower was closer and we had a rock solid connection throughout the entire exercise. The trick to reliable video from these remote sites was HauteSpots microNVR combined with the eWRAP. The microNVR provided on location recording of the video from a Moboix 3 megapixel camera at full resolution and frame rate. The microNVR also transcoded the video into a VGA resolution stream and then pushed it to a media server that HauteSpot set up for the exercise. The eWRAP provided a reliable connection back to the Internet that survived the "ups and downs" of the cellular network. The media server rebroadcast the video so that hundreds or even thousands of simultaneous viewers could watch the video. I recorded the video from the van throughout the entire trip home on my laptop computer in California over an cable Internet connection. What does this all show? That even at 3G speeds of 50-150kbps, good quality VGA video is possible from moving vehicles if you architect your transmission application appropriately. We are now looking at how to productize the media server architecture for reliable streaming. Watch for more soon. Very cool Bob. Looking forward to see what we're able to do with it soon. Our two remote developers are both back in town for the next two weeks and we are focused on finalizing the road map for our two releases this year. Would love to have you down for a day to join us at some point. We're also a day or two away from releasing a v1.1.x (beta) which has many more behind the scenes optimizations which most wouldn't see but you will really appreciate. Let's talk early next week.